Whergio™ is “a platform that allows you to build location based GPS experiences on your computer and play them in the real world.” The platform was created by Groundspeak and released in 2008. 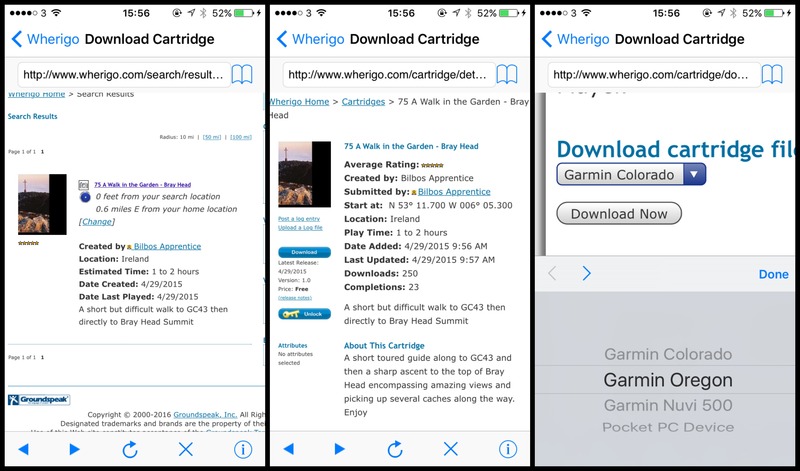 In order to find a wherigo cache, finders must download a ‘cartridge’ to either a smartphone or a compatible GPSr device. There are free apps for both iOS and Android phones and once downloaded, the cartridge is played offline (without using data). If you don’t have a GPSr that is wherigo compatible (such as the Garmin Colorado or Oregon), then you need to download an app on your phone to play. 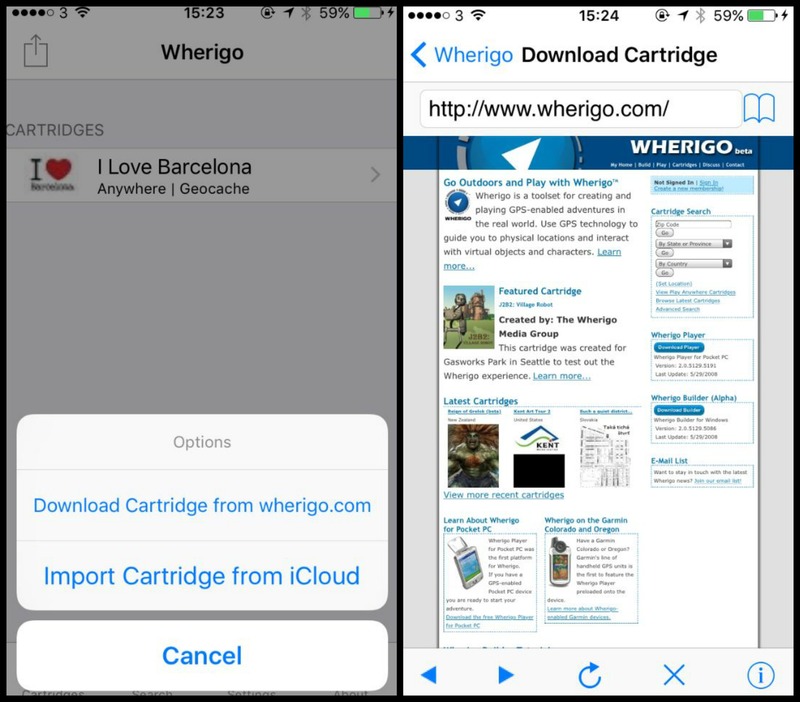 For iPhone, Wherigo™ is the official app. For Android phones, the unofficial WhereYouGo app is popular. 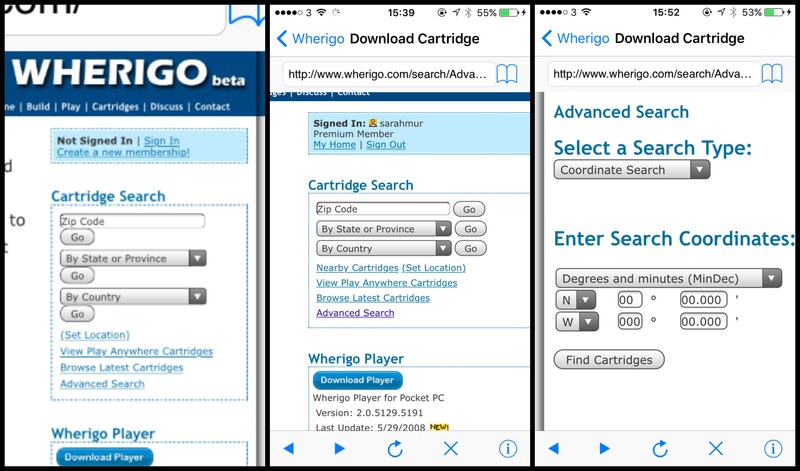 Search for a Wherigo™ cartridge to download. 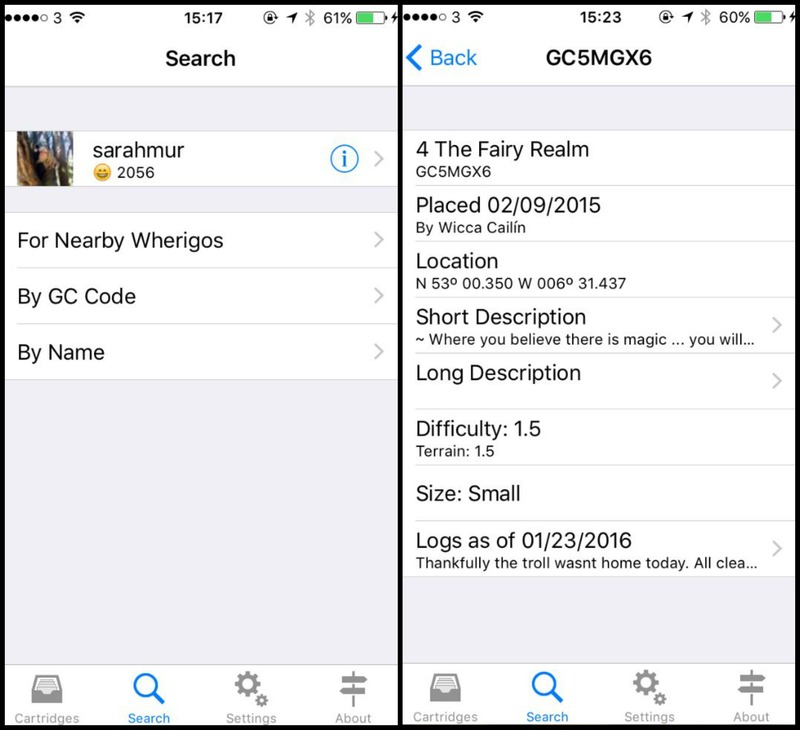 You can search nearby, specific GC codes or cache names. The app will list all the details you find on the cache page, such as the placed date, the cache owner, the listed coordinates and so on. 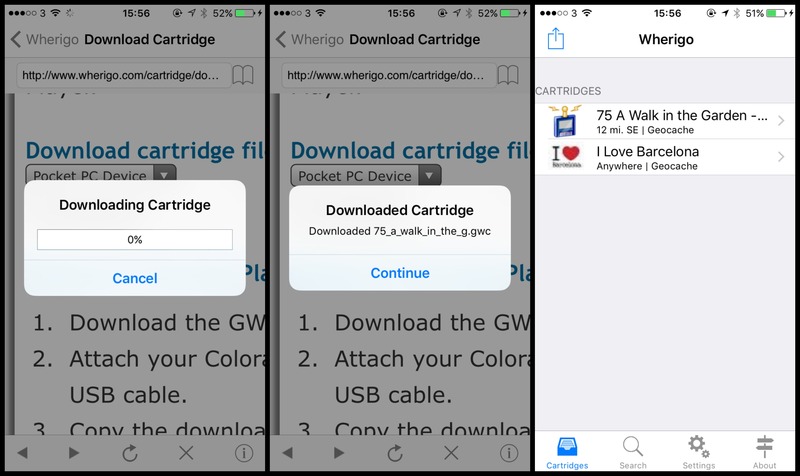 Once you have decided which cartridge you want to download, click on ‘Cartridges’, then click on the box in the top left corner, and it will ask if you want to download the cartridge from wherigo.com, or import cartridge from iCloud. Choose the first option and you will be rediected to wherigo.com. You will then need to sign in, using your geocaching.com credentials. 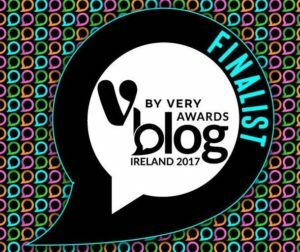 There are numerous ways to search but in my experience, the keyword search does not give all the possible results. 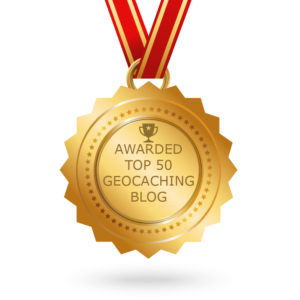 Since you have already chosen the cache on geocaching.com, the most accurate way to search is using the published coordinates on the cache page. The downloaded cartridge will now appear in your list of cartridges. 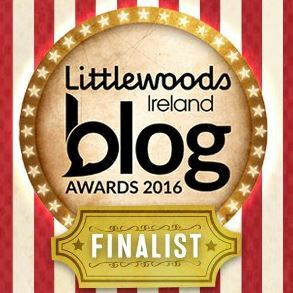 Press ‘play’ and off you go! The cartridge will tell you what to do as you go along. You will need to navigate to certain ‘zones’ to reach the next step of the game. Unlike the Wherigo™ app, it’s not possible to download a cartridge directly in the app, although it looks as if the option exists. When you log in to wherigo.com on your phone’s browser and choose a cartridge to download, it will offer you the option to download with the app, however, this function no longer works (and hasn’t for over a year judging by this Groundspeak Forum discussions). You have to download it in a browser on your phone. As above, choose the file you want to download and choose to download it to a pocket PC. The cartridge with the file extension .gwc will download to a folder on your phone. For the Sony Xperia phone that I used, the cartridge downloaded to storage/emulated/0/download. The folder could be named something different in your phone. After you have downloaded the file, return to the Whereyougo homescreen, and press ‘Start’. You can then search for the downloaded file to open. As above, once you have the cartridge downloaded and you press start, the app will guide you through the steps to find the cache. Once you have downloaded the cartridge in to your chosen app, and pressed ‘start’, you are ready to play. You will navigate to various ‘zones’. Once you are in the zone, the app will inform you what you need to do there or where you need to go next. Wherigos can vary in length and in the number of tasks you need to do, or how far you need to walk. The possibilities are seemingly endless. The apps will pretty much guide you through what you need to do, so the best way to start, is just go and find one! At the end of the wherigo cache, you should be given final coordinates where there will be a geocache container with a logbook to sign, just like any other cache. 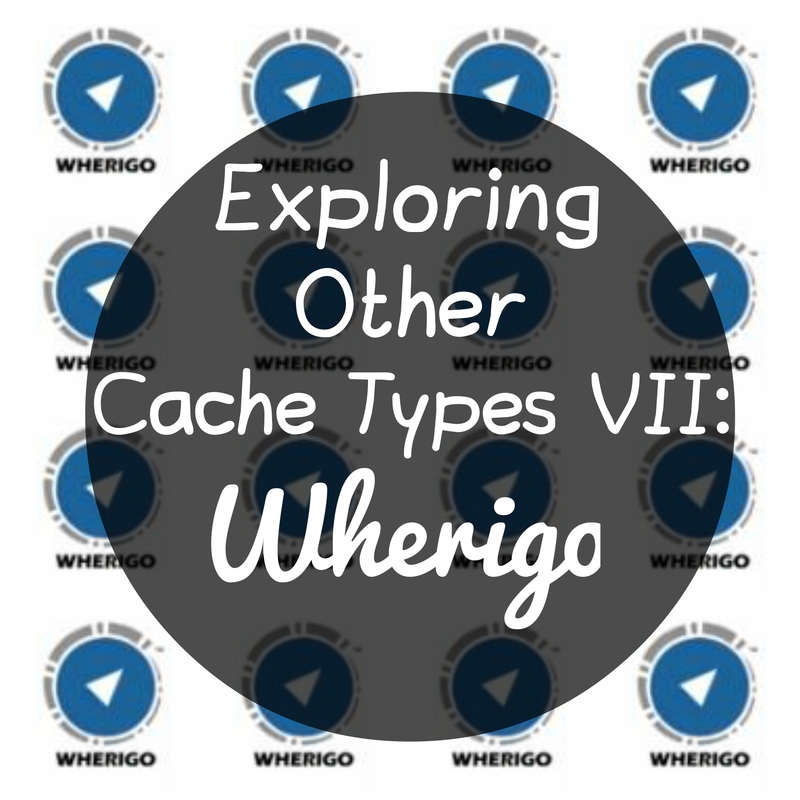 Have you found a wherigo cache yet? Let me know in the comments! Do you have a windows phone? If so, would you like to add something to the above? 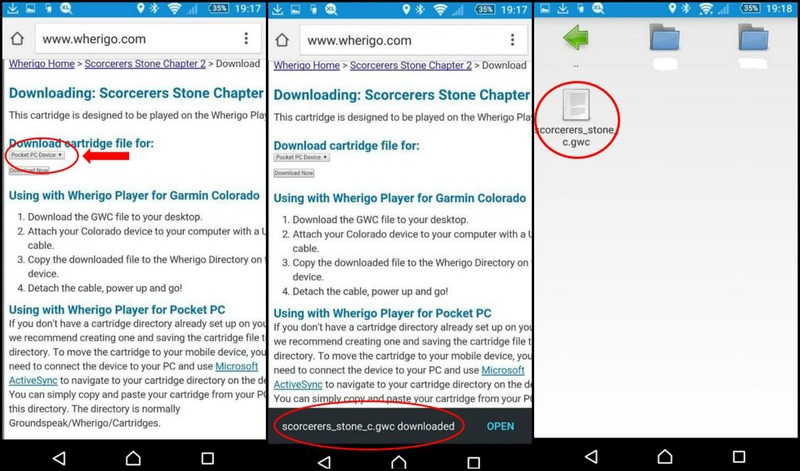 I use c:Geo on an android phone (Moto G) and I find that I can successfully download a whereigo cartridge by selecting the link from the cache page in c:Geo, and it will then run in the WhereYouGo app. However, my niece has a different make of android phone and trying to do exactly the same thing always results in an error when downloading. We don’t know why, but this is probably the failing that you describe. The issue that I have with WhereYouGo is that, although the app is clear how far away the next stage is, the compass will not tell me what direction to go. It has been suggested to me that this is because the Moto G is a budget phone and doesn’t have the processing power to run the cartridges correctly, and hence my experience has been less than satisfactory. But we did have fun navigating round the only one that we have done so far – using the phone to tell us what we should be doing, and the GPS (which is not whereigo compatible) reduced to functioning as a compass! 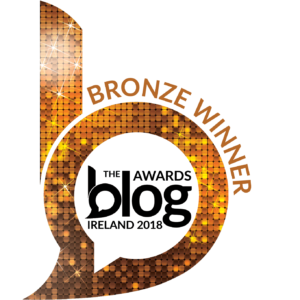 I’ve been iOS for years but found the whereyougo app quite clunky when I tried it for this blog post! I say your post and don’t know where else to ask this. How does one delete a cartridge from the iOS app?